MANCHESTER (Sporting Alert) — Manchester United manager David Moyes is hoping star strikers Robin van Persie and Wayne Rooney will be fit to feature in Wednesday’s New Year’s Day Premier League clash with Tottenham at Old Trafford. Rooney missed Man United‘s 1-0 win over Norwich City with a groin injury which has limited his training this week. “We need to wait and see,” Moyes said about Rooney. “He didn’t train today so we’ll assess him tomorrow and see how he is. Van Persie could also miss another game with a thigh problem. “Van Persie is not quite ready yet, but hopefully he’s not too far away,” the manager said. 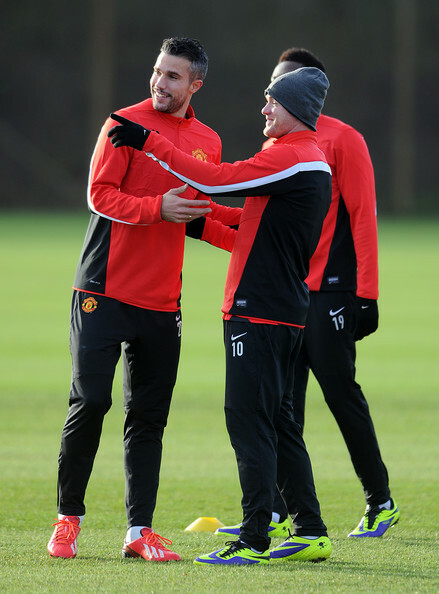 “Robin has started some light training and he might not be too far away as well,” he said. Defender Phil Jones (knee) and Marouane Fellaini (wrist) are also out of the contest. Antonio Valencia will return from suspension after missing the win at Norwich. Tottenham will be without midfielder Paulinho, who will be out for the next four weeks because an ankle ligament injury he suffered in the win against Stoke City. Sandro (calf), Younes Kaboul (thigh), Andros Townsend (hamstring) and Jan Vertonghen (ankle) will also miss out, while Jermain Defoe (hamstring) and Danny Rose (fatigue) are said to be doubtful. However, full-back Kyle Walker is set to return from suspension. Manchester United (from): De Gea, Lindegaard, Johnstone, Rafael, Smalling, Ferdinand, Evans, Evra, Vidic, Fabio, Valencia, Nani, Carrick, Fletcher, Cleverley, Giggs, Anderson, Young, Zaha, Januzaj, Rooney, Welbeck, Kagawa, Hernandez. Tottenham (from): Lloris, Friedel, Walker, Naughton, Fryers, Rose, Dawson, Chiriches, Veljkovic, Capoue, Dembele, Lennon, Fredericks, Bentaleb, Sigurdsson, Eriksen, Chadli, Lamela, Holtby, Adebayor, Defoe, Soldado.